This traditional ottoman is an easy update to your living room style. 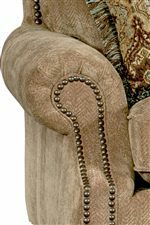 Sitting on finished exposed wood turned legs and with nailhead trim around the bottom the piece has a stylish and sophisticated look. Pair this ottoman with a chair for an even better look and comfortable addition to your home. 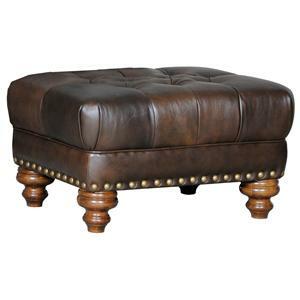 The 5790 Ottoman by Mayo at Olinde's Furniture in the Baton Rouge and Lafayette, Louisiana area. Product availability may vary. Contact us for the most current availability on this product. Leg or Skirt Finished wood spool legs. Padding & Ergonomics Only the highest quality seat cushion is used on Mayo products for a stylish appearance and long lasting comfort. Seat cushions feature plush foam with a softer 1.8 density seat foam that is fabricated inside factory to maintain the highest quality assurance standards. This living room collection brings you stylish features and comfort. Transform an area of your home into something you are proud of with a sofa, loveseat (not shown) or a chair and ottoman. Sectional modular pieces let you create a sectional sofa that fits into your specific space while not sacrificing any style. With fabric options that allow you to choose what you truly want, these pieces help you update your home into an area that is unique to you and your personality. 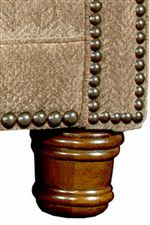 Finished wood legs are used on each piece and nailhead trim options let you create an even better looking piece. Use this collection to update your living room style. The 5790 collection is a great option if you are looking for furniture in the Baton Rouge and Lafayette, Louisiana area. Browse other items in the 5790 collection from Olinde's Furniture in the Baton Rouge and Lafayette, Louisiana area.